Victrex and Magma have always worked side-by-side on m-pipe and that's the way they rose to the F119 challenge. Magma's m-pipe® has emerged as the first F119-certified TCP, and that means it's a proven solution in subsea pipelines. Magma Global m-pipe®, based on high-performing VICTREX™ PEEK thermoplastic composite, has recently achieved the world’s first qualification for a subsea pipe product under DNVGL-RP-F119 for Thermoplastic Composite Pipe (TCP). Global quality assurance and risk management company DNV GL* defined their F119 recommended practice (RP) for use with pipelines in offshore oil & gas (O&G) operations. Following an extensive and challenging testing program, the product qualification covers m-pipe® for dynamic surface to seabed applications. Successful certification with DNV GL’s third-party verification highlights the durability of m-pipe® and its constituent materials. There is a growing interest in thermoplastic composites for subsea applications, due to their corrosion resistance and ability to handle sour service and many of the aggressive chemicals used in the oil and gas industry. An upcoming webinar will drill into the qualification and use of advanced materials role in this. Recent deployments for m-pipe® include a 2.5km flowline development by Tullow Oil in West Africa. "F119 is the most comprehensive procedure that exists today for determining the long-term reliability and safety of a TCP for O&G," explains Dr David Charlesworth, Head of Engineering at Magma Global. In the webinar on Tuesday 13th February 2018, he will detail how m-pipe® achieved the qualification and also cover the importance of the TCP in the O&G sector, its minimum bend radius (MBR), and how the design of m-pipe® aids transport, deployment and connections in subsea applications. Dr Geoff Small, Energy Market Technology Manager at Victrex, will focus on the advanced materials used in the making of m-pipe®, the various testing carried out and the advantages in both performance and qualification which these materials bring. "Victrex and Magma have always worked side-by-side on m-pipe®, with Victrex contributing its decades of accumulated know-how, and that's the way we rose to the F119 challenge," said Dr Small. "Magma's m-pipe® is not simply an innovative high-performance corrosion-free pipe that the O&G industry urgently needs, but it's now emerged as the first F119-certified TCP, and that means it's a proven solution in subsea pipelines." Magma m-pipe® is a high-performance carbon fiber and VICTREX PEEK thermoplastic composite pipe manufactured using a fully automated robotic 3D laser print process. Engineering excellence and detailed structural design result in a high specification pipe that has been shown to reduce risks and costs for risers, jumpers, flowlines and downlines in a wide range of subsea project applications. 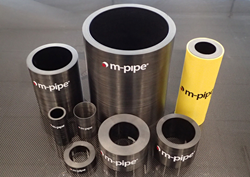 These outstanding properties make m-pipe®, which can be used at depths down to 10,000 feet and withstand pressures of up to 15ksi, a leading solution in subsea pipelines and a cost-effective alternative to traditional steel and non-bonded flexible pipe. Use of its extensive property database specifically targeting O&G applications and covering a wide range of mechanical, physical and chemical resistance properties. Design and evaluation of novel test methods to demonstrate the compliance of VICTREX PEEK with the material qualification sections of the DNVGL document. Materials testing both within Victrex’s own laboratories and a number of outside accredited test labs. The use of m-pipe® can reduce both risks and costs for offshore operators. It requires minimum maintenance and, since it is not subject to corrosion, has a longer lifetime than steel. Dr Charlesworth concludes: “Offshore O&G operations are now encountering extremely difficult subsea environments at greater depths. The pressure is relentless and old-style steel isn't up to the job. An outstanding composite pipe, such as m-pipe®, is what's needed, delivering the strength of steel but not the inevitable corrosion." Webinar: "How Advanced Materials created the world’s first DNV GL RP F119 Qualified Thermoplastic Composite Pipe"